Heart Healthy – Bring A Friend! According to heart.org, less than 30% of high school students perform enough physical activity to keep their hearts healthy. Less than 30 percent. Sadly, there are so few people taking advantage of the simple steps you can take to help your heart. The American Heart Association recommends at least 60 minutes of moderate to vigorous aerobic activity daily. In honor of American Heart Month, here are a few simple, practical and beneficial things you can do to get your heart healthy – and keep it that way. Eat a heart healthy diet. A diet rich in fruits and vegetables, along with whole grains, is just what the doctor ordered. Increasing foods that are good for you, while simultaneously decreasing your intake of sugary drinks, sodium and saturated fats, paves a path to keep your heart happy. Maintain a healthy weight. Eating foods that are good for you not only keeps your heart happy, but your waistline too. Keeping your weight at a level that’s healthy for you is about so much more than looking good. It’s about feeling good, and truly being in good shape. Which leads to another way you can help your heart. Physical activity. This is where Tae Kwon Do comes in. In addition to being an activity that’s fun and engaging, it offers an excellent workout. Tae Kwon Do gets your entire body moving, from head to toe. These simple but powerful tips, along with healthy levels for your cholesterol, blood sugar and blood pressure, can go a long way to helping you live a long and healthy life. Head over to Master Shim’s and get signed up for one of the most exciting workout regiments around. Your heart will thank you for it. And it’s not too late to take advantage of this week’s Special Friend Classes, April 30th-May 5th! Posted in Uncategorized | Comments Off on Heart Healthy – Bring A Friend! Ten-year-old Caroline Rose came to Master Shim’s World Class Tae Kwon Do in February 2017 for Bring A Friend Week … and she never left. 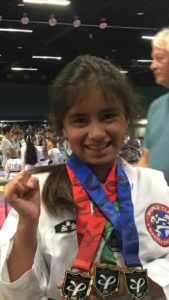 She was honored as the 2017 Student of the Year, is currently a part of the Demo Team, and has won numerous gold medals in tournaments. The Fayetteville location is like her second home. Caroline is thriving in an activity she enjoys. But for her mother, Bethany Clark, this experience means so much more. “We have seen so many changes in Caroline’s self-esteem and confidence. She now speaks with such confidence to everyone and believes in herself,” Bethany states. Here’s a look at February’s featured student, Caroline Rose. I just tested for Black Belt. What issues has Tae Kwon Do helped you overcome? Tae Kwon Do helped me with being bullied by someone I thought was a friend. Why do you enjoy Tae Kwon Do? I love Tae Kwon Do because we do fun exercises and strengthen ourselves. You also make new friends in classes. What has Tae Kwon Do taught you? We learn how to defend ourselves. You were recognized as Student of the Year. What does that honor mean to you? It not only shows me, but (also) the Masters how dedicated I am to Tae Kwon Do. I’ve worked really hard and I continue to practice every day. Lazy days at the beach. Trips to the park and the playground. Taking time to lounge and read a book. The carefree days of summer will soon be upon us. While the kids will no doubt enjoy some down time, they may soon crave a little activity to keep them, well, active. Enter summer camps. Combining mental, emotional and sometimes physical benefits, summer camp can be the perfect outlet for your child. Summer camp can bring children from different neighborhoods, ages and socio-economic backgrounds together. It is the perfect opportunity to learn how to socially interact with interesting people from all walks of life. Children can become more adept at communicating and participation with a wider group of people. Perhaps, among children they don’t see on a daily basis, your child may have the opportunity to exhibit more leadership skills that may be hidden among their normal group of friends. Depending upon the type of camp your child is attending, they can develop greater skills of responsibility and resourcefulness as well. Camps may require them to take on certain tasks, find ways to solve problems, and address specific issues. Their team or group may depend upon them to get their part done. And because it won’t have the stigma of being schoolwork, it may be viewed as a more fun or challenging endeavor. Along those lines, your child can learn a new skill. Again, cloaked in fun and summer activities, they won’t even realize that some actual education has taken place. This list is by no means exhaustive. With camps featuring everything from computer skills to cooking, dance to martial arts, the list of additional benefits is endless. In fact, Master Shim’s World Class Tae Kwon Do offers a summer camp experience like no other. Filled with activities, learning and field trips, it’s sure to bring delight to them – and you. Stay tuned to www.atlantatkd.com for all the camp details. Countless parents use that mantra to encourage their children, when it comes to competition. After all, it can be difficult for children to experience loss, or not capture first place. But competition is definitely not all negative. In fact, good, healthy competition can be beneficial for children physically, mentally and emotionally. Physically, children can learn new skills, and want to improve upon them. The person who wins a competition did something right – leading to the victory. If your child is not the victor, what a great starting point for lessons they can learn and grow from. Mentally, your child can learn to win – and lose – gracefully. A winner who doesn’t handle their success gracefully is not enjoyable to be around. Conversely, a sore loser is just that – a sore loser. Competition provides the opportunity to learn how to handle both situations. Emotionally, competition can improve your child’s self-esteem. Just having the sense of accomplishment can make a world of difference to a child. Completing a task, finishing a game, or entering a contest can be a positive goal they’ve met and completed. In addition to considering these valuable points for your child’s next competition, you can see them in action. Don’t miss Master Shim’s 12th Annual World Class Open Championship on Saturday, April 28. Visit http://atlantatkd.com/event/12th-annual-master-shims-world-class-open-championship/ for more information. 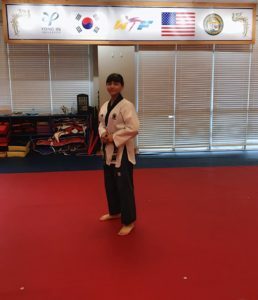 While she actively participates in judo, jiu-jitsu, krav maga, boxing and gymnastics, Tae Kwon Do holds a special place for her. Here’s more about this month’s instructor profile, Kiana Herod. Six years. I grew up watching martial arts movies. I was curious about learning different martial arts and then I found MSWCTKD. I have passion for Tae Kwon Do now. What made you select Master Shim's for your Tae Kwon Do lessons? I saw a few classes before I signed up and I loved the energy along with the passion from all the Masters at the time. Yes, I was bullied at a young age and Tae Kwon Do has helped me become more unafraid. Also, it helped when I tore my ACL because I had to persevere through it. What has Tae Kwon Do done for your confidence? I have become more confident and more responsible by becoming an instructor and student. It’s not only about knowing self-defense, but also to become more respectful and understanding to others. Why would you tell others that it is fun to do? Because it can help you achieve your goals and you can meet new people. April is National Autism Awareness Month. The goal of the month is to educate and build awareness about autism. Autism-society.org notes that as of 2014, more than 3.5 million Americans live with an autism spectrum disorder. And the severity of symptoms can vary greatly along that spectrum. Having a month of national awareness can highlight the difficulties and challenges many people with autism face, in hopes of creating ways to help. One of the ways can be Tae Kwon Do. Tae Kwon Do helps to nurture social skills. As children are learning new skills and trying them out, they are often partnered with another child in class. The comradery of practicing, taking part in the same activity, can help children feel more comfortable in sharing with others. It can also foster confidence. Any child can experience a surge in self-esteem, especially when learning to conquer new moves. Tae Kwon Do contains a lot of repetitive behaviors, which can also be the case with children on the autism spectrum. It can be beneficial for the child to have that trait work to his or her advantage. Motor skills can be greatly developed while practicing Tae Kwon Do. Learning the specific movements necessary to participate in the sport can enhance those skills greatly. The Teenage Mutant Ninja Turtles did it. So did Michael Jai White and Ralph Macchio. You can also include Jaden Smith, along with Po, a giant animated Panda. What great feat was their accomplishment? They starred in a movie that included martial arts. It’s fun to watch this art of grace, strength, determination and agility play out on screen. Whether it’s Tae Kwon Do, Kung Fu, or Karate, the action and adventure manage to intrigue and delight audiences. In honor of the fact that we live in the Hollywood of South, we’d love to know, what is your favorite martial arts film? Tell us, and a prize could be waiting for you! -	Comment on this post on Facebook, with your favorite martial arts film. -	Get friends to “Like” your post. -	The post with the most “Likes” by Saturday, April 28th, will win a prize! Final decisions are at the sole discretion of Master Shim’s World Class Tae Kwon Do. Can’t wait to hear from you! Posted in Uncategorized | Comments Off on Blog Challenge!